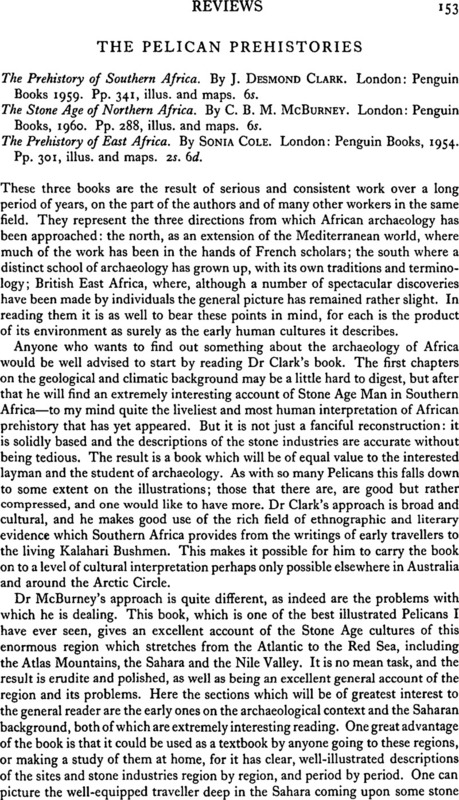 The Pelican Prehistories - The Prehistory of Southern Africa. By J. Desmond Clark. London: Penguin Books1959. Pp. 341, illus. and maps. 6s. - The Stone Age of Northern Africa. By C. B. M. McBurney. London: Penguin Books, 1960. Pp. 288, illus. and maps. 6s. - The Prehistory of East Africa. By Sonia Cole. London: Penguin Books, 1954. Pp. 301, illus. and maps. 2s. 6d.